356 Brentford High Street was the home of my paternal great grandparents, George James Dorrington (1850 -1928) and Elizabeth Ann Dorrington nee Lock (1856 - 1928). George was the Carriers’ Manager of the Carter, Paterson & Co premises from about 1891 to at least 1911. 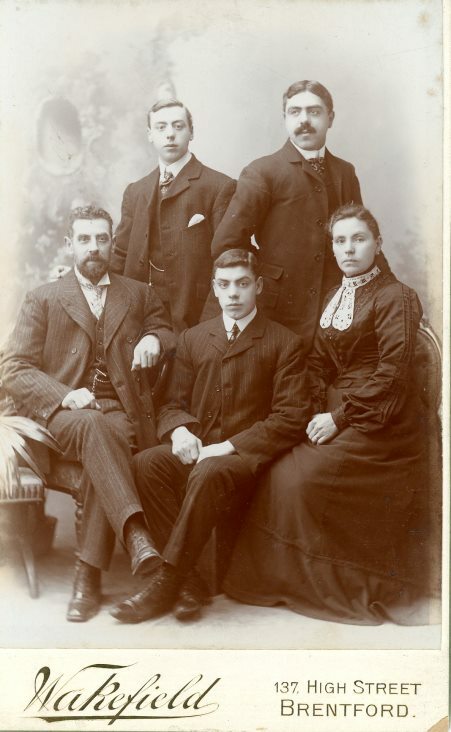 Their 3 children who survived to adulthood (there were 6 live births) were James Henry (1881 – 1952) George (1883 – 1965) and Herbert (1886 – 1917), my grandfather. Herbert Dorrington married Sarah Jane Cooper (1886 - 1959) in 1907. Sarah was born in Distillery Road, Brentford. They had five children and my late father, Bruce Dorrington, was the 4th. The family settled in Brentford. Their final address was in Hamilton Road. Herbert was killed during the battle of Arras on 13th April, 1917 while serving with the 1st Bn The Essex Regiment. He has no known grave but his name appears on the Brentford and Arras War Memorials. My focus for the moment is on Herbert. A number of his living descendants hope to come together to commemorate the centenary of his death. This will probably take the form of a lunch hopefully in Brentford in April or May. I would like to produce an illustrated profile of him for this occasion. Unfortunately, very little personal information concerning Herbert has survived - no family, individual or military photos, medals, war diary or letters from the front. Any help in highlighting this lack of memorabilia of Herbert’s family and military life under your section ‘Can You Help?’ would be greatly appreciated. One item that has come to light from a cousin recently is a photograph, believed to be of the Dorrington family of 356 Brentford High Street, taken by Wakefield of Brentford ( Herbert appears on this as a teenager seated between his parents ). The individuals are not named but on the back has been written ‘The Dorrington Family ? date Approx. 1902.’ It fits the known whereabouts of the family members in the 1901 census and has been handed down within the family. To me, Herbert in this photograph, is recognisably ‘a Dorrington’. If you are able to help please get in touch, I will forward any information to Jean.